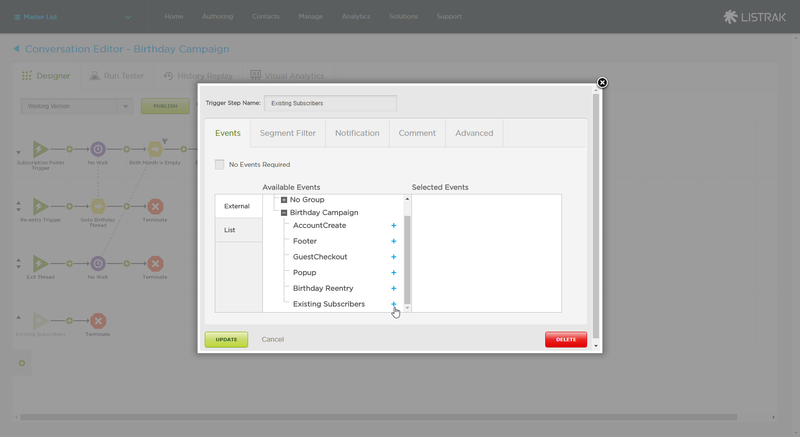 Learn more about how to add existing subscribers into your previously set up Birthday Campaign. If you've already set up a Birthday Campaign in this article, you can take this campaign to the next level by adding your existing subscribers to the campaign. Simply add these subscribers based on their original subscription date. This article is broken down into two sections: existing subscribers with a birthdate and without a birthdate. Follow each of the sections below. Before getting started, ensure that existing subscribers that have a BirthDate field is utilizing the same field that's being used in the Birthday Campaign. 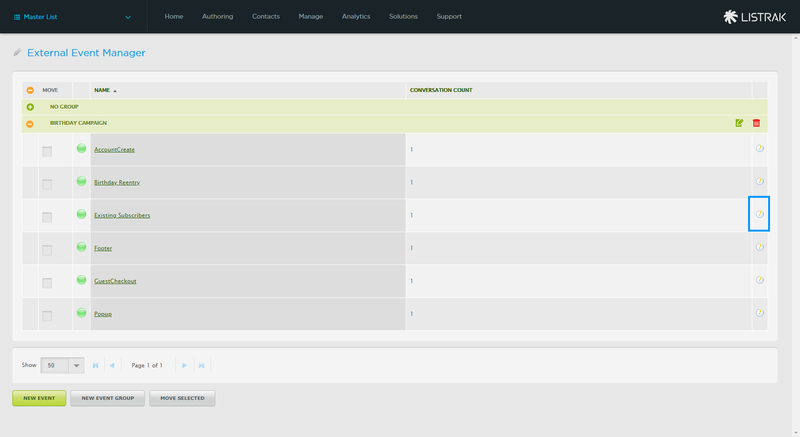 Check this by navigating from the home menu to Contacts > Segmentation > Modify Existing Field Group. 1. 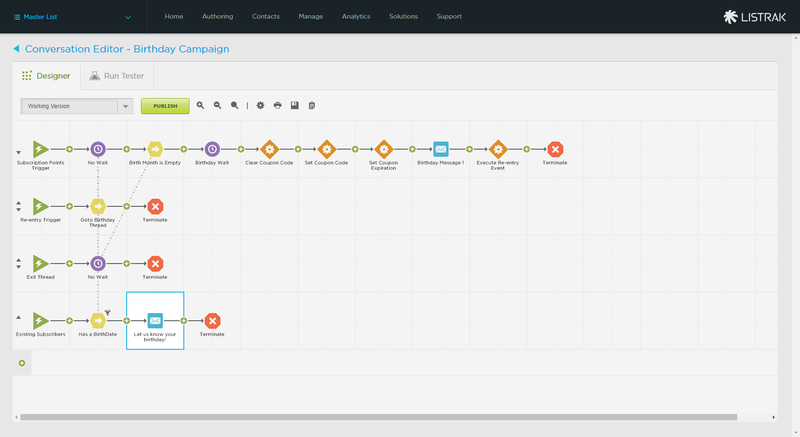 Navigate to your Birthday Campaign. 2. Click the Pencil Icon to navigate to the working version. 4. Click the New Trigger step. 5. Enter Existing Subscribers for the name. 6. Select the + icon next to the Existing Subscribers external event that was created in the previous article. 8. Click the Add Step icon after the Existing Subscribers trigger step. 9. Select a Goto Step. 10. Click the Goto Step. 11. Navigate to the Goto tab. 12. Select the No Wait step in the Birthday Trigger thread. This allows previous subscribers to enter the same steps as new subscribers. 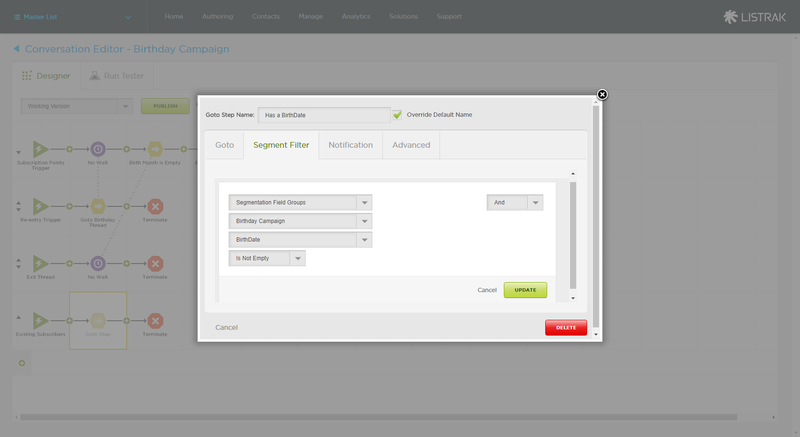 NOTE: There is no need to add a Segment Filter in the Goto Step. The following steps explain where to add a filter within the external event page when adding existing subscribers into the conversation. 4. Click Execute External Event. 5. Select Birthday Campaign for the Execute Event On option. 6. Create the following filter to check that the BirthDate Is Not Empty. This ensures previous subscribers without a birthday will not be allowed to enter the conversation. Apply the following filter: segmentation field groups, birthday campaign (or another field group that has your subscriber birthdates), BirthDate (or another field that has your subscriber birthdates), and is not empty. Existing subscribers should be entering through the Birthday Campaign conversation. Follow the below steps to build out a conversation for subscribers who do not have a birthdate in Listrak. 2. Click the Pencil Icon to go to the working version. 6. Select the plus icon next to the Existing Subscribers external event that was created in the previous article. 11. Click the Override Default Name checkbox. 12. Enter Has a BirthDate for the name. 13. Navigate to the Goto tab. 14. Select the No Wait step in the Birthday Trigger thread. 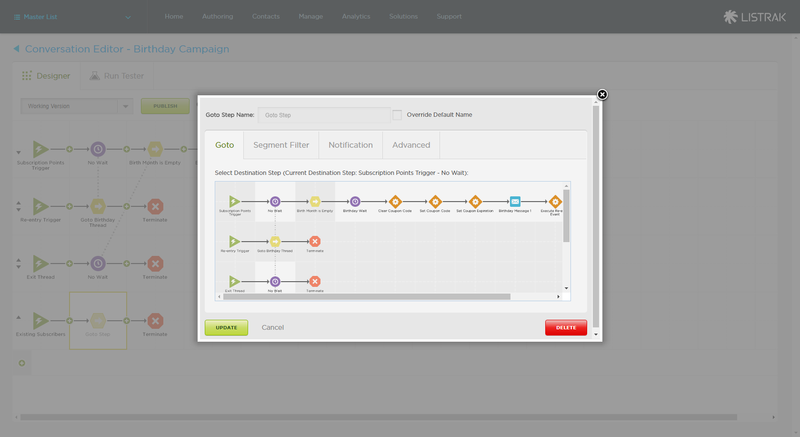 This ensures the previous subscribers will enter the same steps as new subscribers. 15. Click the Segment Filter tab. 16. Create the following filter to send only existing subscribers to the birthday thread if they have a birthdate filled out: segmentation field groups, birthday campaign (or another field group that has your subscriber birthdates), BirthDate (or another field that has your subscriber birthdates), and is not empty. 18. 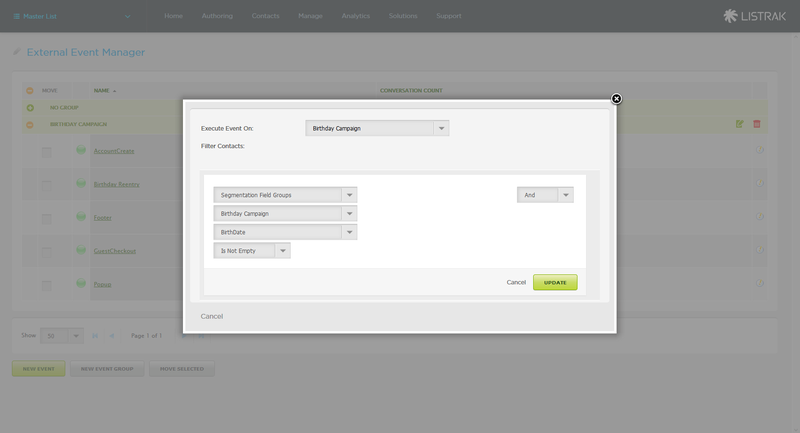 Click the Add Step icon after the Has a Birthdate Goto step. 19. Select a Message Step. 20. Create a message for the message step that lets the subscriber know that you don't have information about their birthday. Direct them to a subscription point on your website that asks for them to supply a birthdate to receive special offers on their birthday. 21. Commit the message to the conversation. 22. Click the Birth Month is Empty Goto step in the Subscription Points Trigger thread. 23. Navigate to the Goto tab. 24. Click the Message Step that you just committed to the Existing Subscribers thread. This will send new subscribers that have not supplied their birthdate to the existing subscribers with no birthdate thread. If any of these subscribers fill out their birthdate, they will be entered in the Subscription Points Trigger thread automatically. 26. Click the Exit Thread trigger step. 27. Click Delete. This thread will not be used anymore. 30. 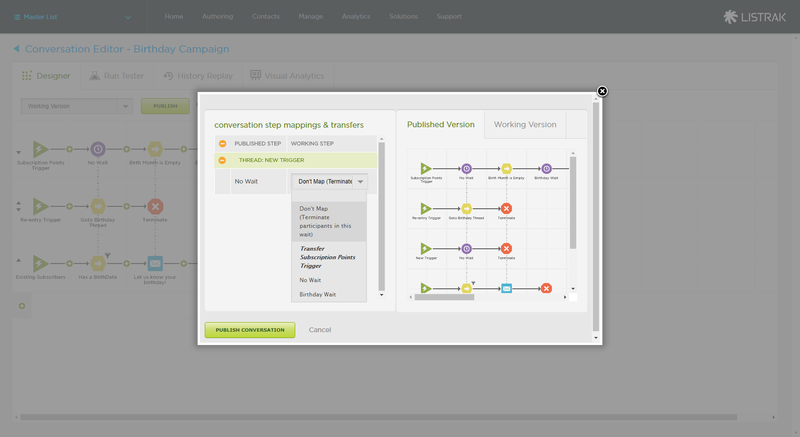 Click Edit Mappings and Publish. 31. In the drop-down next to the No Wait step, select Don't Map (Terminate participants in this wait). You should start seeing your existing subscribers entering the Birthday Campaign conversation. 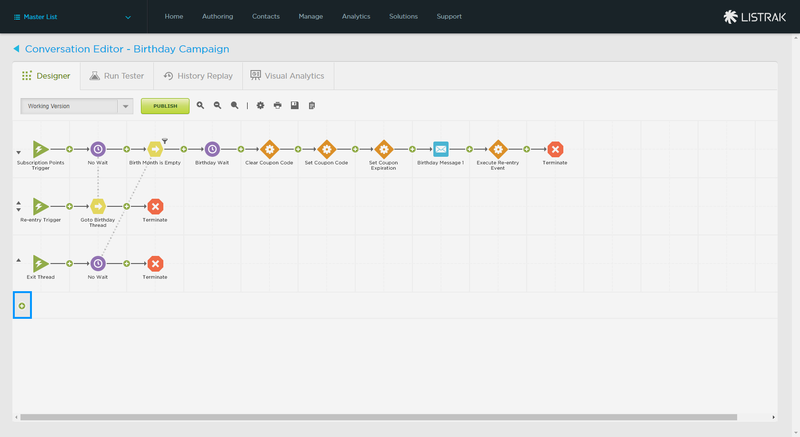 Be sure to keep an eye on your conversation performance using the Conversation Analytics and Conversion Dashboard!